When I was attending the most recent Wisdom 2.0 conference in San Francisco, I had the pleasure of seeing Dan Harris speak. He was a compelling and entertaining speaker and my interest was piqued in reinvigorating my own meditation practice as a result of listening to him. For years, I was good about meditating, at least somewhat regularly. 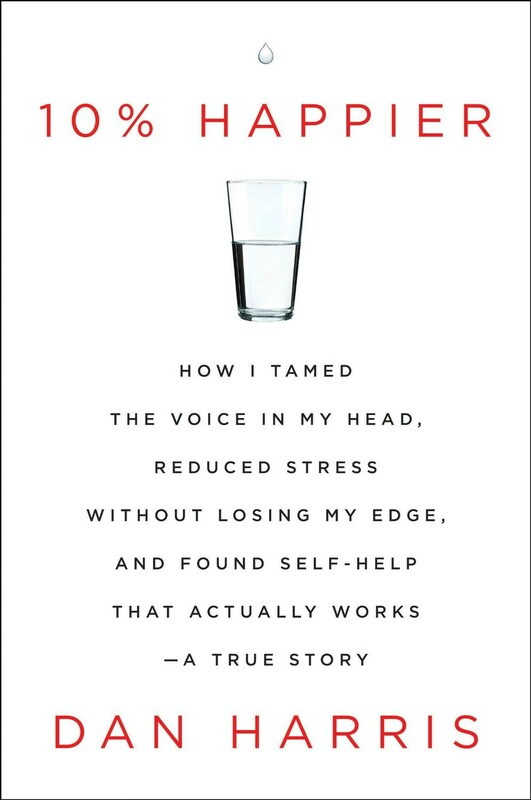 But I fell out of the habit and Dan Harris’s presentation prompted me to use his book, 10% Happier: How I Tamed the Voice in My Head, Reduced Stress Without Losing My Edge, and Found Self-Help That Actually Works, as the jumpstart inspiration to get me meditating again. It worked. I’m back to meditating for at least a few minutes every day, and I felt the positive impact immediately when I started. Hopefully I won’t fall prey to the laziness that kept me from meditating in the past. Anyway, about Harris’s book. It’s wonderful. Highly recommended. Harris, a respected television newsman and anchor, tells the personal story of his fall into the depths of depression and dysfunction and the inspiring way he then figured out how to beat back and manage the demons that had plagued him, with meditation being the key. Throughout the book, Harris dissects much of the messaging doled out by many well-known self-help and spiritual personalities and cobbles together a practical and doable approach that works for him. Meditation is at the core of the approach. In short, Harris had figured out how to be happier. In his view, maybe 10% happier. Although, Harris by no means feels 10% is the maximum increase in happiness possible. But he contends that anyone who sticks to a regular meditation and mindfulness approach to life will likely be at least 10% happier. My own life story tends to agree with Harris. I’m happier when I meditate. 10% Happier is written in a friendly style with a lot of humor and honest transparency from Harris. One thing it’s not, however, is a how to guide for meditation. For meditation instruction, you’ll need to seek elsewhere, but I really do recommend you read this book first to best position your meditation efforts on a solid foundation of “why” you’re doing it. For some quick guidance on meditation itself, Harris offers a 7-day free introduction to meditation with video lessons that teach the essentials, guided audio meditations that walk you through the practice, and a coach to help you follow through. Harris hosts a 10% Happier podcast too. I thoroughly enjoyed this book. I find Harris’s style to be a breath of fresh air amid the often somber and overly serious approaches many meditation teachers and advocates espouse. By keeping meditation and mindfulness in the realm of practical and doable without a lot of burdensome trappings, Harris is doing the world a great service enticing the masses to this important way of improving one’s life. Buy the book. You’ll be glad you did. I find all of life fascinating and write about it.